HP GT printers give free 2-year on-site warranty and HP original ink - Hello! Welcome to my blog! HP gives its customers more than just high-volume printing at an extremely low-cost. 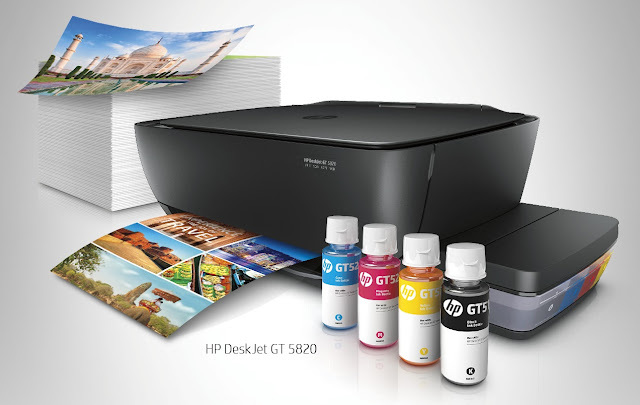 Now, it gives away a free two-year, on-site warranty and a free HP GT51 Black Original Ink bottle for every purchase of an HP DeskJet GT 5810 All-in-One Printer or an HP DeskJet GT 5820 Wireless All-in-One Printer from authorized HP resellers. The free two-year, on-site warranty, which includes free repair services by an authorized HP technician, is applicable for Metro Manila purchases while carry-in warranty is applicable for selected provincial areas only. With the HP GT51 Black Original Ink, HP DeskJet 5810 and 5820 printers can produce up to 5,000 pages of crisp, sharp, black text or print more than 8,000 visually-stunning print-outs with the color set. Customers can also experience MESS-FREE and stress-free printing with HP’s easy-access, spill-free ink tank system, while the HP DeskJet 5820 Wireless All-in-One Printer provides an easy mobile printing technology through any smart phone or tablet. Hurry and get a hold of the HP DeskJet GT 5810 All-in-One Printer or the HP DeskJet GT 5820 Wireless All-in-One Printer to experience instant, quality printing! Promo runs from February 1 to April 30, 2017. To avail of other HP warranty services, call the official HP Warranty Hotline at (+632) 867-3551 or visit www8.hp.com for more exciting promos. See posters and print ads for more details.